Tourist activities naturally revolve around the majestic Victoria Falls and many hours can be spent exploring the pathways through the rainforest below the falls, where various lookout platforms beg for endless photographs. 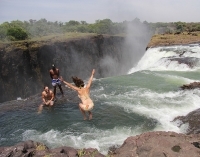 The Zambezi River is also a well-deserving playground for travellers: for active, adventurous types there is extreme whitewater rafting, river boarding, bungee jumping, gorge swinging and the thrilling Devil's Pool; and for the peace-loving there are languid sunset cruises, relaxed canoeing opportunities, and breathtaking helicopter rides. National Parks in the region promise good game viewing and a genuine African safari experience. There are even elephant-back safaris available! The area is extremely well-developed in terms of tourist amenities, with many different tours of the region on offer and plentiful restaurants and bars to keep visitors entertained. There are wonderful curio markets and artisan stalls dotted about the town. Travellers will be able to pick up some gorgeous locally-made souvenirs to take home with them, however some hard-bargaining is recommended as foreigners do tend to get overcharged for these pretty collectables!